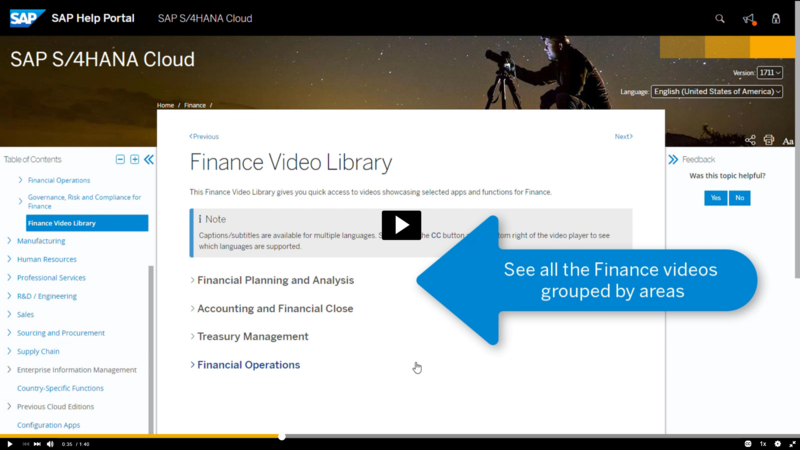 Would you like to get a glimpse at SAP S/4HANA apps in Finance? Do you want to know how to monitor bank fee data or how to extend master data for fixed assets? Or many other tasks central to our finance management? Just go to our new Finance Video Library and browse through the different videos. Our how-tos guide you through various processes in the SAP S/4HANA system step by step. SAP Help Portal to read more about the app. for non-English-native speakers to capture the details. Arabic, Chinese (PRC), Chinese (Taiwan), Danish, Dutch, English, French, German, Hungarian, Italian, Japanese, Korean, Malay, Portuguese (Brazilian), Russian, Spanish, and Swedish. Our video library is growing constantly. Watch out for new videos!